This essay presents a vision for technology integration in teacher education that develops teachers into “technology integrationists,” or teachers who thoughtfully choose to integrate technology when it supports students' subject matter learning. Four principles guide the design of technology learning experiences for preservice and in-service teachers to increase the likelihood that they will become technology integrationists. The principles are (a) connecting technology learning to professional knowledge; (b) privileging subject matter and pedagogical content connections; (c) using technology learning to challenge professional knowledge; and (d) teaching many technologies. The advantages and limitations of using these principles with preservice and in-service teachers are discussed. Future innovations in technology learning approaches in teacher education are outlined. Hughes, J. (2004). Technology Learning Principles for Preservice and In-service Teacher Education. 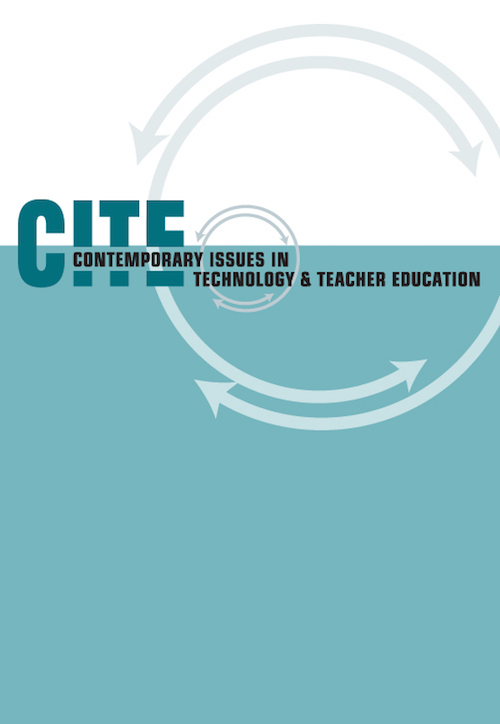 Contemporary Issues in Technology and Teacher Education, 4 (3), 345-362. Waynesville, NC USA: Society for Information Technology & Teacher Education. Retrieved April 22, 2019 from https://www.learntechlib.org/primary/p/19950/. Beckett, E., Wetzel, K., Buss, R., Marquez-Chisholm, I., & Midobuche, E. (2001). Preservice and inservice teachers collaborate to integrate technology into K-8 classrooms. Proceedings of the Society for Information Technology and Teacher Education International Conference 2001 (1) , 1858-1863. Norfolk, VA: Association for the Advancement of Computers in Education. Bransford, J.D., & Schwartz, D.L. (1999). Rethinking transfer: A simple proposal with multiple implications. In A. Iran-Nejad & P.D. Pearson (Eds. ), Review of research in education (pp. 61-100). Washington, DC: American Educational Research Association. CEO Forum. (1997). Year 1 Report: From pillars to progress. Washington DC: Author. Confrey, J., Resta, P., Petrosino, A., & Tothero, M. (2002). Inventing new strategies for integrating technology into education. Society for Information Technology and Teacher Education International Conference 2002 (1), 1726-1727. Norfolk, VA: Association for the Advancement of Computing in Education. Crockett, M.D. (2002). Inquiry as professional development: Creating dilemmas through teachers' work. Teaching and Teacher Education, 18, 609-624. Crohen, M. (2001). Summer school and the learning is easy. Learning and Leading with Technology, 29(1), 50-56. Dede, C. (2001). A new century demands new ways of learning. In D.T. Gordon (Ed. ), The digital classroom (pp. 171-174). Cambridge, MA: Harvard Education Letter. Doering, A., Hughes, J.E., & Huffman, D. (2003). Preservice teachers: Are we thinking with technology? Journal of Research on Technology in Education, 35 (3), 342-36 1. Drier, H.S. (2001, March). Beliefs, experiences, and reflections that affect the development of techno-mathematical knowledge. Paper presented at the Society for Information Technology and Teacher Education, Orlando, FL. Dun, A., Feldman, A., & Rearick, M. (2000, April). Teaching and learning with computers in schools: The development of instructional technology pedagogical content knowledge. Paper presented at the American Educational Research Association, New Orleans, LA. Hargrave, C.P., & Hsu, Y. (2000). Survey of instructional technology courses for preservice teachers. Journal of Technology and Teacher Education, 8(4), 303-314. Hiebert, J., Gallimore, R., & Stigler, J. (2002). A knowledge base for the teaching profession: What would it look like and how can we get one? Educational Researcher, 31 (5), 3-1 5. Holland, P.E. (2001). Professional development in technology: Catalyst for school reform. Journal of Technology and Teacher Education, 9 (2), 245-2 6 7. Howard, B.C., McGee, S., Schwartz, N., & Purcell, S. (2000). The experience of constructivism: Transforming teacher epistemology. Journal of Research on Computing in Education, 32 (4), 455-465. Hughes, J.E. (2003). Toward a model of teachers' technology-learning. Action in Teacher Education, 24 (4), 10-1 7. Mills, B. (2003). Raising the bar: Technology enhances learning during a mock trial project. Learning and Leading with Technology, 30 (5), 42-45. Niess, M.L. (2001). A model for integrating technology in preservice science and mathematics content-specific teacher preparation. School Science and Mathematics, 101 (2), 102-109. Norton, S., McRobbie, C.J., & Cooper, T.J. (2000). Exploring secondary mathematics teachers' reasons for not using computers in their teaching: Five case studies. Journal of Research on Computing in Education, 33(1), 87-109. Perry, G.S., & Aregaldo, R.J. (2001). The computers are here! Now what does the principal do? In C. Collier (Ed. ), Technology in its place: Successful technology infusion in schools (pp. 87-98). San Francisco: Jossey-Bass. Pressley, M., & McCormick, C.B. (1995). Advanced educational psychology for educators, researchers, and policymakers. New York: Harper Collins. Rice, M.L., Wilson, E.K., & Bagley, W. (2001). Transforming learning with technology: Lessons from the field. Journal of Technology and Teacher Education, 9 (2), 211-230. Sandholtz, J.H., Ringstaff, C., & Dwyer, D.C. (1997). Teaching with technology: Creating student-centered classrooms. New York: Teachers College Press. Skinner, R. (2002). Technology counts 2002: E-defining education. EdWeek, 21 (35), 58. Sprague, D., & Norton, P. (1999). Studying technology as a cohort: Teachers’ reflections on the process. Proceedings of the Society for Information Technology and Teacher Education International Conference 1999 (1), 722-727. Norfolk, VA: Association for the Advancement of Computing in Education. Starkweather, K.N. (2002). ITEA/Gallup poll: Interpreting what others think of technology teaching. The Technology Teacher, 61 (8), 31-33. Swan, K., Holmes, A., Vargas, J.D., Jennings, S., Meier, E., & Rubenfeld, L. (2002). Situated professional development and technology integration: The Capital Area technology and inquiry in education (CATIE) mentoring program. Journal of Technology and Teacher Education, 10 (2), 169-190. Warburton, J., & Campbell, R. (2001). Finding the poetic in a technological world: Integrating poetry and computer technology in a teacher education program. Journal of Technology and Teacher Education, 9 (4), 585-5 9 7. Willis, E.M., & Sujo de Montes, L. (2002). Does requiring a technology course in preservice teacher education affect student teacher's technology use in the classroom? Journal of Computing in Teacher Education, 18(3) , 76-80. Wiske, S. (2001). A new culture of teaching in the 21st century. In D.T. Gordon (Ed. ), The digital classroom (pp. 69-77). Cambridge, MA: Harvard Education Letter.